After using my Far Infrared Cocoon for a month I can already see that it’s been an excellent investment in my health, and a marvelous tool to have in the invisible war against the immune system. Thank you Mark for helping bring the cutting edge of medical science to the comfort of people’s homes. I am a 58 year old woman who was diagnosed with ankylosing spondylitis in my mid-twenties. The AS was severe for a few years but for the last 25 years I’ve only had occasional recurrences of the main symptoms and a fairly low level of aches and stiffness. The main reason that I bought a Cocoon was for general health purposes, to detox and for fatigue, and also to deal with the occasional pain and stiffness. My first experience of healing with the Cocoon was after I’d dropped a heavy saucepan on my foot, which then became inflamed and painful. I used the Cocoon for about 30 mins and the inflammation subsided completely. I recently injured my shoulder and experienced a flare-up of AS symptoms – inflammation in my spine during the night and stiffness in the morning. Until this point I hadn’t been using the Cocoon for a while because the broken collar bone made it impossible to get inside it and I’d lent it to a relative. I got it back and after a few daily sessions in the Cocoon the flare-up subsided and I have been almost completely pain-free. After one particularly bad night (when I hadn’t been able to use the Cocoon the day before and had only used it a couple of times before that) I found it almost impossible to do my usual AS exercises in the morning, especially the pelvic tilt. I tried them again immediately after a 20 minute session in the Cocoon and had absolutely no pain or difficulty at all. This demonstrates how effectively Far Infrared deals with inflammation. For me that makes it worth every penny and I would recommend that anyone with a chronic inflammatory condition should at least try a Get Fitt System. I also have a MOBI pad, which I use in an armchair or in the car, and love it because it’s very soothing if my back gets stiff and also lightweight, so that I can carry it around easily myself. Finally, I recommend Gett-Fitt as a company because the customer service is excellent. Robyn and Mark are very knowledgeable and have been extremely helpful and supportive. It’s obvious that they have a real passion for their products and for helping people to get the best out of them. I have been using the FIR cocoon for nearly 2 years now and am pleased that I opted to have the Get Fitt support programme throughout. Tests on my mitrochondrial function had shown that I have some blocking which is probably the reason why I suffer from fibromyalgia, and I was recommended to try a detoxification programme, including the use of the Get Fitt Far Infrared sauna. I was quite sceptical at first as my tolerance of heat is minimal, as I continued the Far Infrared programme I found that my tolerance of heat outside, as well as in the sauna, was improved. Finally, I am able to sweat again – not just in the cocoon. After 9 months using the cocoon I had my mitochondrial function retested and there was a significant improvement, which backs up my experience of being able to live a more active life, taking up dance and exercise classes, and coping with more stress, including managing a 7 month building project on my home that I previously could not have contemplated. The support has been helpful on matters of diet, exercise and supplement regime, the latter of which was very helpful for mitigating the effects of Gilbert’s syndrome, which I hope is slowing down the production of further toxins – my eyes and skin are less yellow. There is always something new to learn from the Get fit Team as their knowledge is extensive, and together we have been doing a lot of investigation to find a programme to improve my health. The Support team are always sympathetic and understanding, which I value greatly. There is no doubt in my mind that I could not have managed this level of improvement on my own. Thank you and your team for such a wonderful product.The Cocoon system has rid my body of all the wood preservatives and other toxins. My doctor once tried new medication on me which made me more tired. Then I discussed it with the people from Get Fitt and they changed my schedule. One and a half years after the first mitochondrial function test I did the test again to see if I made progress. I made good progress although I am not there yet. Once Mark had explained the detoxifying process through using the Cocoon System and its success at treating my condition in particular, I instantly knew I had to give it a go. Get Fitt’s knowledge, support and confidence in the treatment’s success is invaluable. Wanted to update you on my progress…. in the last 2 days I have managed to sell my house, pack up most of its contents, load them into the car and drive from Enfield to Guildford… i think things are on the up!!!! all that after 8 weeks in bed, I can’t believe it! Having been battling Multiple Chemical Sensitivity Disorder and Chronic Fatigue Syndrome for years, I had almost given up hope of getting better, but I was fortunate enough to be put in touch with Mark at Get Fitt Ltd.
Get Fitt’s knowledge, support and confidence in the treatment’s success is invaluable.My Doctor performed A Mitochondrial Function Test which showed that the Mitochondria were not working properly and that I had CFS. On my Doctor’s suggestion I contacted Get Fitt Ltd and with his guidance started on a detox program using Far Infrared Thermal Treatment. In conclusion “the proof of the pudding …etc”, I have felt better since starting to use the Cocoon SystemTMand am hoping that this will continue. I’ve been meaning to share the good news of my discovery for weeks. I have recently acquired this wonderful wonderful FIR (Far Infrared) blanket that you can use lying on a bed :-)))) It is bliss! I had read about the benefits of FIR a couple of years ago when I first read Rich van Konynenburg’s advised treatment procedure for ME. It is really good for gentle detoxing. But after I’d read that I hadn’t heard of anywhere you could go for FIR saunas and I imagined it would be incredibly expensive so forgot about it again, also as I’m not usually one for heat and the thought of a sauna filled me with dread. And this recommendation isfrom someone who is pretty heat sensitive and didn’t really like the idea of saunaing. This Cocoon SystemTM is different to a conventional sauna in that there is no steam or anything just warmth and it wraps round your body leaving your head out to keep cool, I do it with the window open and a nice breeze on my head. You need to shower straight after to wash away any toxins you have sweated out.Better still, is that the Cocoon SystemTM FIR blankets are provided by GetFitt who really seem to understand ME/CFS and who are going out of their way to make FIR saunaing available to people with such conditions. I developed chronic fatigue syndrome (‘cfs’) during a lengthy trip abroad travelling in Asia in early 2003 after having glandular fever in December 2002. It grew steadily worse, frequently leaving me house and even bed-bound and by mid-2007 I had developed multiple chemical sensitivity (‘mcs’) too, reacting strongly to most kinds of perfume, wood and cigarette smoke, household paints and almost all common household detergents. The numerous doctors I consulted could find nothing physiologically wrong despite the fact that I was clearly very unwell. In mid 2007 I consulted a Doctot who had a particular interest in fatigue-related illnesses. They took a blood sample which was sent to a biochemist who found that my mitochondria (the ‘engines’ within cells which enable us to produce energy) were blocked by a dye-based chemical. I also had high levels of heavy metals (mercury, arsenic and cadmium) and was sensitive to nickel. Major dietary changes were recommended and that I take a number of supplements aimed at giving my system the ‘fuel’ it needed to attempt to combat my problems. The Doctor also suggested that I use a Get Fitt Far infrared sauna to assist with detoxification. I have found Get-Fitt’s services to be professional and user-friendly and am in no doubt that, for those in the unfortunate position in which I found myself healthwise, their product and service works. I have no hesitation in recommending them. Corinna (cfs and mcs sufferer)– Still saunaing – and still improving! Thanks again for your splendid product – I was not really expecting much, and to be honest was rather surprised to realise that it does actually work! I am writing to let you know that I am thrilled to bits with my Get- Fitt Far Infrared Cocoon – Sauna system. I bought it to help me get rid of heavy metals. I was apprehensive about whether I would be able to tolerate it as I am electro-sensitive. The first few times that I used it I did have a very slight reaction but I noticed that it only lasted for a few minutes. You explained to me that the Far infrared may actually strengthen the body’s own electrical field and therefore helps to make it less vulnerable to electro-magnetic frequencies. It also seems to “antidote” any other reactions that I have had to such frequencies. I have suffered from Fibromyalgia for many years. I was never one to use medication so I searched for alternative remedy’s to manage my pain. I came across Get Fitt and decided to give them a call. The team was very helpful in explaining how Far Infrared works which was of great interest to me. I decided to go ahead and purchase my Far infrared Sauna. At first I was a little too eager and went on for the full hour nearly every day. My body wasn’t ready for that kind of detox so with the advice from the Get Fitt support team, I reduced the amount of time spent on the bed which helped a great deal. I have had my bed for over a year now. Detoxing this way has been a great benefit to me and my symptoms and the heat helps my muscles to relax more and helps with the pain also. I would like to take this opportunity to thank the team and the founder of Get Fitt for my wonderful Sauna. After having suffered from Fibromyalgia for six and a half years and, having tried a wide variety of treatments and remedies, I was initially somewhat sceptical that regular Far Infrared treatments would alleviate the condition. I purchased the Cocoon on the recommendation of a fellow sufferer. My sleep pattern is much improved. Most nights I sleep for five to six hours without waking at all. I used to wake several times in the night and only slept for three hours, at the most, without waking. I now wake up on most mornings without pain and am no longer taking any pain killers, although I sometimes still have to use a TENS machine later in the day. As a result my energy levels have increased and I no longer need to use pacing to manage my condition. Using the Cocoon on the days I do three to four mile walks, reduces my overall stiffness at the end of the day. In fact, I often climb into the Cocoon feeling sore and achy and emerge feeling warm and comfortable. When I use the Cocoon, I often fall into a state of deep relaxation/meditation, which results in a tremendous feeling of wellbeing. My masseuse reports that she is amazed how much softer and more relaxed my muscles have become. So I would strongly recommend the regular use of a Far Infrared Cocoon to fellow sufferers. Be prepared to commit time to the use of the Cocoon in order to reap the benefits. I also recommend using the phone support service provided by the Get-Fitt team as this is extremely helpful in the early stages of treatment. The swelling in my extremities is almost completely gone, episodes of atrial fibrillation have decreased to almost never, the brain fog is gone, my system is totally regular, and I actually feel a bit of real energy now and again. So, all in all, even at this early stage, I think I can give the FAR infrared Cocoon SystemTM a hearty recommendation. I DO feel better and, for me, having the Oedema that has plagued me for some years now just kind of go away is a miracle. More update on the FAR infrared Cocoon SystemTM. At this point, I can tell you that it is the greatest thing since sliced bread. I am SO happy to have my energy and health restored to the point that it is that I want everyone to try it! After a trip to my optician for a routine eye test prompted me to make an appointment with my doctor. My optician had detected what he thought was the tell tale sign of a high cholesterol level. A subsequent blood test confirmed this in fact to be the case and it was around this time that I learned about the Get Fitt Far Infrared Sauna systems and how, when used can have a positive effect in helping to reduce cholesterol levels (quite apart from all the myriad other benefits that accrue from treating the body with far infrared energy). As if that wasn’t enough in itself, there is far more to report two years on from having first used my cocoon. I am pleased to say that I have not experienced a single cold or viral infection over the two years of using the cocoon and what’s more, the ferocious Scottish winters (which are not in any way getting less forgiving) are altogether more manageable courtesy of the warmth and sense of well being generated by my Cocoon. I can still well remember leaving my flat one cold January evening after having given myself a session in the Cocoon feeling like one of the children who were used in the ‘Ready Brek’ adverts screened in the seventies. I felt myself to be glowing and the change in my general demeanour was quite palpable. After a month of using the Far Infrared sauna CocoonTM, my stiff joints had completely gone and the restlessness in my legs improved by 50% and was completely gone 2 months later. My anxiety has greatly reduced, my sleep has improved and I have almost double the energy I used to have. My overall quality of life has improved and I am very grateful for the help and support I got from everyone at Get Fitt. After five months on nutritional supplements the same tests showed my condition had actually deteriorated. My Doctor performed a Test which revealed the mitochondria were blocked by the toxin Nitrosamine. On my Doctor’s suggestion I contacted Mark at Get Fitt Ltd and with his guidance started on a detox program using Far Infrared Thermal Treatment. The results of my two fat tests and my mitochondrial test show I am now clear. I still can’t quite believe that the Far Infrared programme managed to clear so much so quickly. 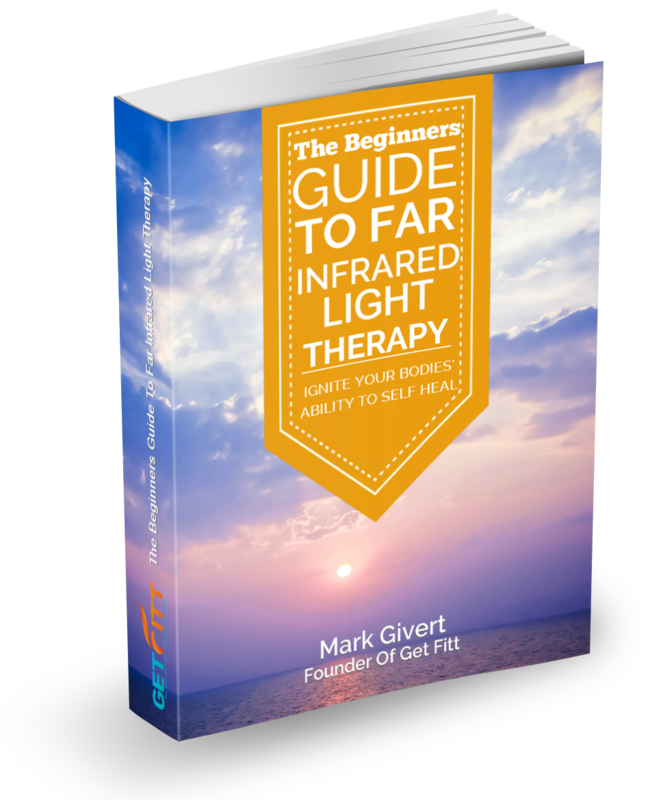 On the recommendation of my doctor, I contacted Mark at Get Fitt regarding the benefits of Far Infrared Treatment. Mark asked me about my symptoms, so I told him I have been suffering from multiple chemical sensitivity for a number of years as a result of long-term exposure to hazardous chemicals in the workplace. I started to use the Far Infrared Sauna two weeks ago and already I am feeling a great deal better and have oodles of energy. Get Fitt’s telephone monitoring and support during the detox programme, was really helpful. They are very knowledgeable about our environment and health effects and are able to offer a variety of equipment to help…….. I have had M.S. for 25 years now. I have been using the cocoon for about 8 weeks. I’m very pleased with the results I’ve been seeing. I’ve had many symptoms that are disappearing. My energy level has increased tremendously. My always cold hands and feet are now warm. My depression and anxiety levels have dropped tremendously. I’ve had leg spasms that are gone. The craving for sweets has dropped and so has my exhaustion level. I’m not moody.There are a number of other symptoms that have lessened drastically. Since using the Cocoon SystemTM for just over 6 weeks, I didn’t realize how much it had done for me until I looked back at how I was when I first started using it. The monitoring and support that I have received from Get Fitt has been fantastic too – they have really helped me alot. My name is Jane and I am 40 years old. I was diagnosed with MS in July 2006, just before my 40thbirthday! Multiple Sclerosis, numbness, tingling, stabbing eye pain, black and white vision, painful electric shock sensations, CFS, Interstitial Cystitis, repeated cystitis, leaky gut, poor circulation, low stomach acid, insomnia, repeated fungal infections, breast pain, skin problems, nutritional deficiencies, painful ‘pulling’ let muscle, gum problems, undiagnosed respiratory problems and arthritis symptoms- joints swelling, pain and ceasing up etc. I drank weedkiller when I was 2 and had access to ‘the chemical shed’, and from an early age have had repeated exposure to farm and horticultural chemicals, including getting covered with sheep dip (organophosphates) regularly and there was an unknown grey powder all over the barn where I played as a child. It emitted a pungent chemical smell when I washed my hands, which lasted for days. We sometimes worked (from the age of 7) amongst puddles of chemicals after spraying equipment had been rinsed and bags of chemicals would sometimes burst and be left lying around. My father believed that the products were safe, or that they would not be allowed. At the age of 15, I ended up rushed to hospital, and being told I was ‘heading for a stomach ulcer’ For several years I had awful bouts of excess saliva production, uncontrollable throat spasms, pretty bad depression, memory problems, chronic fatigue, hallucinations, balance problems and far too much adrenalin – I have since been on beta blockers 3 times to slow my heart rate. I have used lead and cadmium quite a lot and have had 3 MRI scans. My brother also worked next door to our farm in the horticultural business and had a 2″ brain tumour removed and his body produces no testosterone. He often breathed in the weedkiller ’round up’ whilst spraying crops in the 1990’s. No-one used any protective masks or clothing.My father developed severe hyper-mania and psychosis and died in a mental hospital. Thinking that I may well have toxic issues…. I bought one. Get Fitt were fantastic, they provided regular phone support and closely monitored my programme. I felt supported by the knowledgeable and friendly voice at the end of the phone. it was difficult to get out, being so warm and relaxing. I very rarely used to sweat (and neither did my mother) but the Far Infrared Sauna kick-started my system and I now sweat normally, which feels very cleansing – My circulation has improved a lot and I also don’t feel the cold so much anymore. The headaches have gone, my skin has improved and increased energy levels have made it possible for me to work 7 days a week, often working 15 – 17 hours a day singlehandedly renovating my new art gallery and working on painting commissions for my customers. 19 years with multiple sclerosis and in wheelchair for 10 years. Prior to beginning Far Infrared Thermal Treatment I constantly felt ill and weak. There were no days that I felt well. Soon after beginning just 5 minutes a day in my Cocoon SystemTM , I no longer felt unwell. As the treatment program progressed, I began to feel well and have more energy. Now, 3 months into the program I am feeling well and energised most of the time. My general overall physical and mental states have improved significantly. The blanket has been a major factor in my improved quality of life. I have had M.S. for 25 years now. I’ve had many symptoms that are disappearing. I have been using the cocoon for about 6 weeks. I’m very pleased with the results I’ve been seeing. My energy level has increased tremendously. My always cold hands and feet are now warm. My depression and anxiety levels have dropped tremendously. I’ve had leg spasms that are gone. The craving for sweets has dropped and so has my exhaustion level. I’m not moody. I suffer with arthritis in my hands, and back/hip pain after an 18 feet fall 5 years ago.The Far Infrared Sauna CocoonTM has been marvellous. My arthritis is much improved and It relieves the pain in my back/hip. I am a 49 year old personal trainer. Exercise has always been a major part of my life. In terms of time spent exercising, + 20 hours per week, I could be classed as an athlete. My diet is largely healthy – organic foods, fruit and veggies as far as possible, whole foods and minimal processed foodstuffs. I am on the wellness side of the continuum. I first started using the sauna about 6 months ago. The very first thing that astounded me was sleep. I’ve always slept well. I’m tired at the end of the day and go to sleep and wake up easily. Ever since I had my children I sleep lightly – my children cough, snore, turn, I hear it. After using the sauna only 2or 3 times my sleep became much deeper and when my head hit the pillow I knew absolutely nothing till morning and when I woke up I was refreshed. The deepest most wonderful sleep I have ever had. The days I sauna there is always this same glorious effect. Thanks so much for arranging for the delivery of my Far Infrared CocoonTM yesterday, the best birthday present I could have hoped for. I tried the sauna this morning. The Far Infrared Sauna gives excellent results, really effective heat distribution, with really fantastically user-friendly controls.We appreciate the intelligent design and high quality of your equipment in comparison with the other types of blanket on the market. At the beginning of the sauna I went in with quite acute lower back pain and after half an hour I came out and the pain had eased considerably. I also feel extremely relaxed and at ease. What a wonderful start to my new treatment! Once again, Mark, thanks so much. I had a low back whiplash injury as a result of a car accident. Although I did the usual things of going to see my osteopath and then a physiotherapist and massage therapist, the day long ache in my lower back continued. I purchased a Get Fitt Far Infrared system and found that each time I used it my back was pain free for a little longer each day. It was an essential part of my journey to recovery. I would strongly recommend FIR and Get Fitt. The team was very helpful in explaining how Far Infrared works which was of great interest to me. I decided to go ahead and purchase my Get Fitt Far infrared Sauna System. I have had my Far Infrared system for over a year now. Detoxing this way has been a great benefit to me and my symptoms and the heat helps my muscles to relax more and helps with the pain also. First I must say this is one of the best buy I’ve done till now. It really helped with my back problem (shoulders and lower back). Even my physiotherapist would notice the difference. It’s helped me a lot during last winter which has been long, very cold and humid. Thanks to the FIR Cocoon the sensation of having the cold in my bones was gone. I also used to feel itchy quite often and this has all disappeared completely. I must thank you Mark as well as your team for the support you gave during the first weeks when I received the product. I felt I met a very caring team. Nowadays I use it once a week or even once every 2 weeks and I don’t regret one second my purchase. I have ME and have been using the Far Infra Red Sauna for over 18 months now and have found it to be a great help in aiding my recovery. I have always found the Get-Fitt support team to be very encouraging. The help and advice on general health and nutrition I received fro mthe team I have found invaluable. I have been given many treatments over the last 10 years to alleviate neck pain caused by cervical degeneration. The pinched nerves in my neck caused pain and tingling down the left arm. I have attended pain clinics, physiotherapy, tai-chi, to name but a few. Two courses of radio frequency denervation cut the pain signals but over time the nerves regenerated so the pain came back. However, since using the Cocoon under the guidance of the Get Fitt support team, my nerve pain has almost disappeared. I am able to do many things such as gardening without being in agonising pain. Gentle exercises are a part of my daily routine – it is as if I have moved back in time. May it long continue. Everyday. He was able to walk and play with much more ease afterwards. He also suffered a stroke which left his body twisted. After just two sessions on the CocoonTM the twist had gone and he asked to go on the far infrared Sauna CocoonTM everyday. As a child I suffered from severe urinary tract infections for months and months at a time. These infections went untreated for many years, aged 17 I had an ultrasound that revealed I had scarring on my bladder from the recurrent infections. I was told that I had very little bladder capacity due to the masses of scar tissue that had built up; my doctor said that this damage could not be reversed. A few months after this diagnosis I began to use the FIR cocoon for general detox, little did I know that FIR was also healing the scarring on my bladder. Three years on Far Infrared Thermal Therapy has treated the scarring on my bladder to an extent that my doctors can now see little if any scarring. Now I use a FIR regime to control my bladder infections- so when I do get an infection its gone within days without the use of antibiotics. I have been using the Far Infrared Cocoon System for two months now and the results have been incredible, I have lost two stone in weight and my symptoms have greatly reduced. After many years of suffering with alot of pain, severe stiffness of the body, (including a frozen shoulder) nasal congestion and fatigue I spoke with my personal detox specialist at Get Fitt. He explained that a lot of the problems we encounter as we get older are due to toxic substances building up the body due to incorrect food habits. He added that a detox programme is only effective if we don’t “retox” by again taking foods that do not suit us. It was suggested that firstly I drop out the “nightshade foods” which I had never heard of and which he suspected may be a cause of my stiffness. Unfortunately they included some foods (potatoes, tomatoes) that I liked but I was happy to try anything that might improve my health. In addition I was advised to commence a detox programme using the Far infrared Cocoon System which I started with his close supervision and guidance. Then he also took me to some of the larger supermarkets and taught me how to shop for foods that were healthy, nutritious and easy to prepare. I was then also shown some simple quick and delicious recipes that were ideal for my busy life style. I was optimistic but was not prepared for the sudden and stark change in my health. After three weeks I am less stiff, my shoulder has improved to such a degree that I am now playing tennis again (I had to give up the sport I loved for six months due to pain). Also my nasal congestion has reduced significantly, I have much better concentration and my energy levels have increased dramatically. For me this simple and effective programme has put me in charge of my health and has given me simple tools that will serve me well. Thanks Mark ….. from one happy customer. P.S By the way I forgot to mention the added bonus of an effortless half stone (7 lbs) weight loss….in just a few weeks.